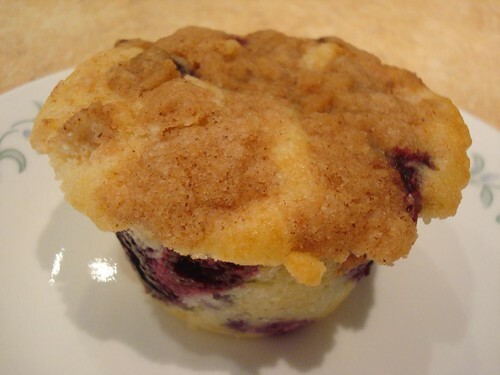 Last summer, I made blueberry muffins. And while I liked that recipe, it wasn't omg-I'll-never-leave-you good. So, when I found myself when a container of blueberries and husband who wanted muffins, I thought I would try another. This time I turned to All Recipes. I figured with a 4.5 star rating and over 4,000 reviews, these had to be good. RINSE and REMOVE stems from berries. 1. This recipe made a LOT of crumb topping, so I was very generous with the sprinkling. You could probably halve the amount and be fine. 2. The crumb topping was tasty, but pushed these firmly into the dessert realm. Even my hubby (who likes pie for breakfast) found them a bit much first thing in the morning. Perhaps a lighter touch would help. 3. The texture of these was wonderful. They pulled apart quite nicely and were light and moist. 4. There were not enough berries to go around, my last couple of muffins were actually berry-less! Definitely increase the berries to 1 1/2 or 2 cups. 5. The end result? These were good, but I am still on a quest for the perfect blueberry muffin recipe!